This is one of my favorite body creams of all times! I have been using this since I was about 15 years old. I never slather this all over my skin as it would be over kill, i usually just apply a bit to my arms. I always have to have a jar in my lotions and potions drawer. It leaves the freshes cleanest scent on your skin and it lasts for hours! I alwasy get compliments whenever I wear this cream. 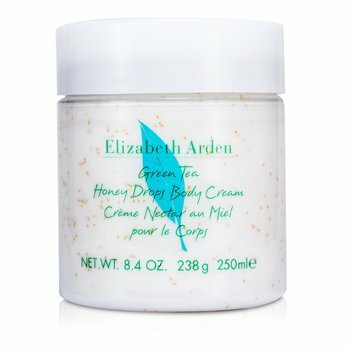 There are other products in the line – perfume, gel moisture, deoderant, body wash etc – but I feel that that the Green Tea honey Drops Body cream smells the absolute best!! Check out your depratment store for click here to shop at Elizabeth Arden’s website. What is your favorite perfumed lotion? I have been using MAC studio Fix Fluid liquid foundtion for years and I reall like it and the coverage it provides. Lately I have noticed that the summer weather and my Studio Fix have been clashing. The heavier coverage and the intense sun light makes me look a bit overdone at times. I decided to try MAC’s Face and Boday foundation to see if this coverage would mea good fit for me and my skin issues. I got a sample and I wore it for a few days- everyone complimented me on my natural looking skin and asked me if I was even wearing any foundation! All the positive feed back made me almost excited to go back to my MAC store to purchase my very own bottle – which I did and I adore the product- my new summer must have foundation!!! The foundation is very light and watery. I suggest dropping the brushes and tools for this one and apply the foundation with your fingers. In my opinion to get the best results you have to apply area by area with your finger tips and you have to rub it in, with circular motions, until the founation becomes a bit tacky. When the foundation becomes tacky i find that it is at its peak for coverage. The more you rub it into your skin the more coverage you get. Work around your face applying region by region and rub it in good. When you have applied to every area go back and apply a second coat to “problem” areas. The foundation makes your face look really shiney at first and you feel it on your face (doesnt feel weightless) after a few minutes the shine and the heavy feeling does go away. When you are complete I suggest setting the foundation with a mineral skin finish natural powder. I find that MAC mineral powderswok well with my skin and do not leave me with an ashy talcy appearance- which can by amplified in direct sunlight. I then add a bronzer to the hallows of my checks, my temples and I blend any access around my hair line- I use Mineralized Skinfinish in comfort(limited and will be re launched in “MAC in the Groove Jult 8th. For me the foundation wears pretty well much like MAC studio Fix and Select. I find that my look stays fresh all day if I use a oil blot sheet mid day and then dust on a bit more mineral powder. I have switched my summer foundation routine up to include MAC face and boday foundation becasue I really like the light natural look it gives in bright summer daylight. It wears well and lasts just like my Studio Fix Fluid and it feel light on the skin. The only thing that I am going to watch out for is breakouts – I havent been using it for long and I cannot really tell you how my skin has acted with repeated wear of this product over a period of time. I will do a mini post in a month and let you guys know how it is going. A lot of product comes in the bottle so I am figuring one bottle will last me the whole summer. I suggets that if you do not have serious spots that you are trying to conceal that you get a sample of the foundation from your MAC store and it out. Let me know if you have use this foundation or if you picked it up! Tell me what you think. I have always loved Dove body washes – I feel that they leaves my skin feeling really clean and fresh. I like all the scents but I usually use the Green Cucumber wash – I love the scent and I even have the body spray and the deodorant too. But a few weeks ago I was in my drug store and noticed new Dove body wash products. When I popped the lid to smell them I instantly fell in love and “needed” to pick up on up! I decided to try GO Fresh Burst- it has a very citrus sweet candy orange type scent. I have been using it for a few weeks and I love it! My skin doesn’t feel like it has a film residue on it, and it leaves my skin feeling clean and non greasy. The scent makes your bathroom smell amazing – but it only left a very light scent on my skin that did not last long- perfect because it didn’t interfere with perfume or scented body lotions. I do find the formula very runny and you have to be careful not to empty too much onto your puff or washing cloth – but it suds up nicely. 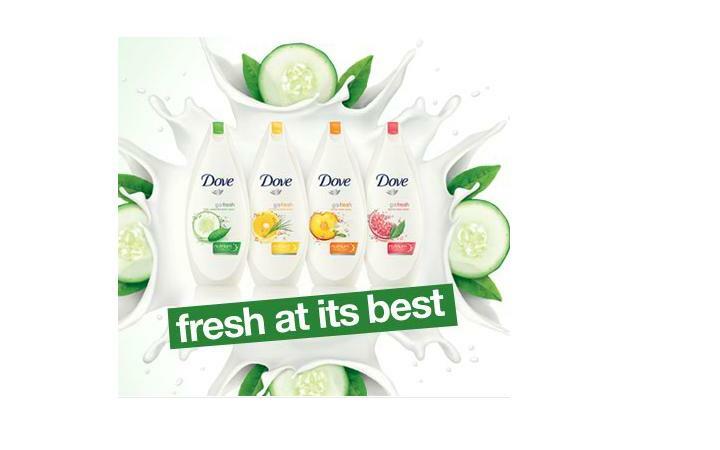 All in all I will definitely try another scent – I am thinking Go Fresh Touch just because I am in love with Dove’s Cool Cucumber products. 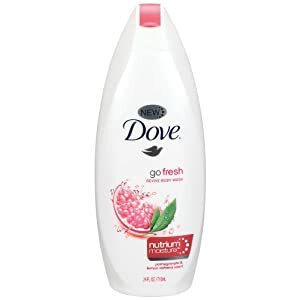 In conjunction with the body washes Dove has launched deodorants, body sprays and bar soaps in the same scents these additional products are probably located in your deodorant isle and bar soap area at your drugstore. A juicy burst of freshness with white ginger, sun-kissed nectarine and succulent passion fruit revives your skin and brightens your senses and an exotic blend of Indian jasmine, tamarind and fresh pineapple provides you with a sensation of luscious freshness. A refreshingly light sensation with the crisp, clean fragrance of cucumber & green tea. An ultra-light hydrating formula. An ultra-light hydrating gel formula with fine beads to invigorate your skin with the exhilarating fragrance of grapefruit & lemongrass. A gentle awakening for your mind and skin. The lively, quenching scent of pomegranate & lemon verbena. The products with Nutrium Moisture are the new launches (in white bottles) the Go Fresh line has been around for a while in the Scents: Refresh – Water lily & fresh mint(blue bottle), Energize- grapefruit & lemon grass (yellow bottle) and Cool Moisture- Cucumber and green tea (green bottle). I have used these body washes on and off over the last year or more and I really like them as well- they get your skin really clean and fresh. I do notice that the new line with Nutrium Moisture does slightly leave your skin a bit more moisturized than the original line. Replenishes skin with a sheer burst of hydration. Fast absorbing and non-sticky moisture leaves skin feeling cool and healthy. Great product for summer weather for normal skin to slightly dry skin. I like this product for myself because it did not melt away in the sun, and it left my skin feeling moisturized and left a nice fresh light scent that last for a few hours. It did not feel sticky at all, I didn’t have to wait for it to dry before putting on pants or leggings on – you know what I mean if you have done this before. I would not suggest this product for the harsher months or if you have dry skin, or if you are using a medication that is causing dry skin. It is a good skin quench top up but it by no means an effective skin healing moisturizer. I find that drench it all over my skin but I have to apply a second helping to elbows and knees as it is just so light. Elbows and knees need to have a second application. What is it? 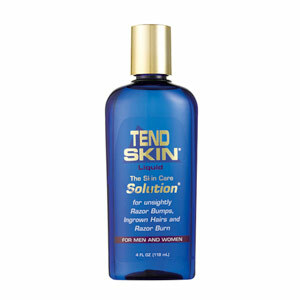 Tend skin is a alcohol based solution that is used to help get rid of razor bumps, ingrown hairs etc. It can be used by both men and women for most normal areas that you shave, wax, have electrolysis (not 100% sure if you should use it after you used a hair removal cream such as Nair.) It is safe to use on the bread area, neck, back, legs, bikini line, underarm, arms, chest, stomach, head – most areas that are not sensitive. Do not use on sun damaged, broken skin. Cautions on the bottle say if you are allergic to Aspirin do not use the product. I purchased this product a month and a half ago and I absolutely do not know why I didn’t know about it before! My spa therapist suggested to me after I was complaining about my nasty annoying ingrown on my legs. I had told her I had tried other “bump” creams and I even only use my razors once then throw away- with no luck of ridding my legs of the irritation. She suggested Tend Skin Liquid (which I almost forgot to purchase before I left). That night I shaved my legs and applied the liquid. I will not lie- it did sting after I shaved to apply this stuff, and you can smell the alcohol from a mile away, but the sting and smell wore off very quickly. The next morning, to my amazement, my skin was soft and smooth! The directions say to apply twice a day, until the irritation is gone – so I applied more and was sooo happy that I put on a skirt and went to work…..mistake!!! Once I had gotten out of my car and gotten into work I noticed that my legs were ashy looking!! White residue everywhere! – I learned my lesson!! 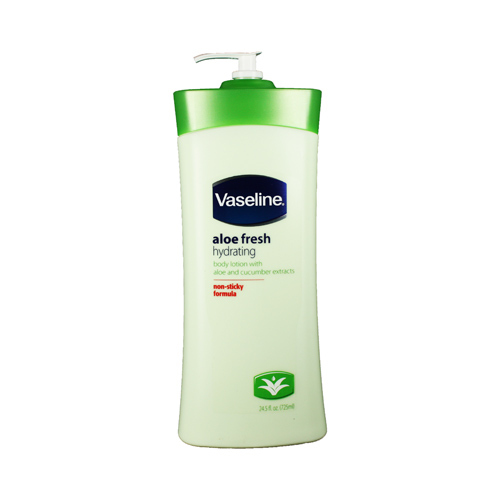 My solution: Apply only at night and in the morning I moisturize with a light lotion – I am loving Vaseline Aloe Fresh lotion right now for the summer (Non greasy formula). Re purchase : 100% I will not go without having this among my products ever !